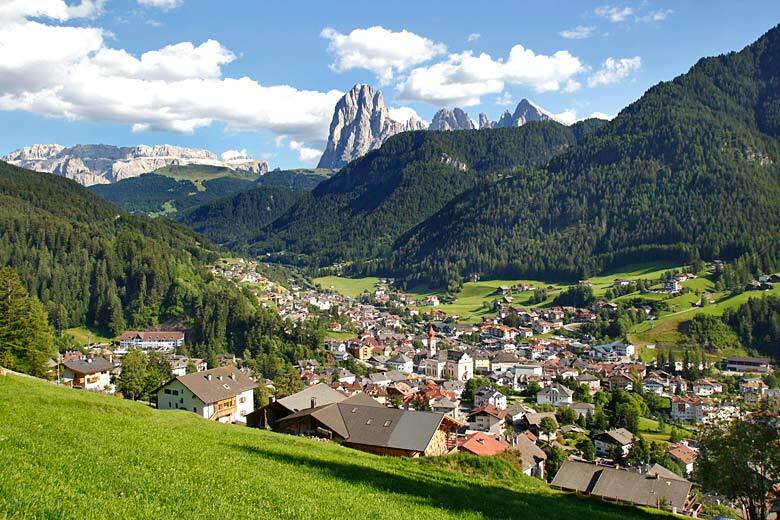 The Val Gardena valley sits in the Dolomites mountain chain in the northeast corner of Italy, a mere 75 km from the Austrian border. It's skiing country in winter but when the Alpine snows melt, the pretty town of Ortisei, at 1,230 m above sea level, is a centre for hiking, climbing and e-biking. The province of South Tyrol (also known as Alto Adige) is an idyll of limestone summits, flower meadows, forests and sharp steepled churches. It was part of Austria until the First World War and has three official languages: Italian, German and ancient Ladin, spoken in this traditional wood carving region for 2,000 years. 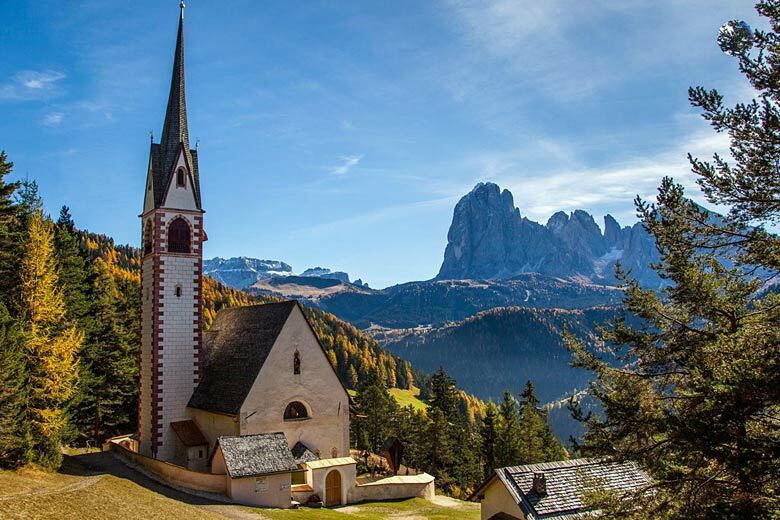 Delight in the Dolomites: if Italy's mountainous ranges set your heart racing, check out the latest deals on holidays to the Dolomites with TUI, which offers breaks departing from airports across the UK. Swiss-French designer Le Corbusier is said to have dubbed the Dolomites the 'most beautiful natural architecture in the world'. This paradise, a UNESCO World Heritage Nature Site, was formed 250 million years ago from huge coral reefs in a primordial sea, which were hoisted skywards by the clash of tectonic plates. At sunrise and sunset, the grey Dolomitic heights are tinged rose and then violet in a phenomenon called the Enrosadira (a Ladin term meaning 'turning pink'), caused by the minerals in the rock. The Sassolungo, a huge 1,381 m monolith looming over Ortisei, is transformed into a glowing spire. 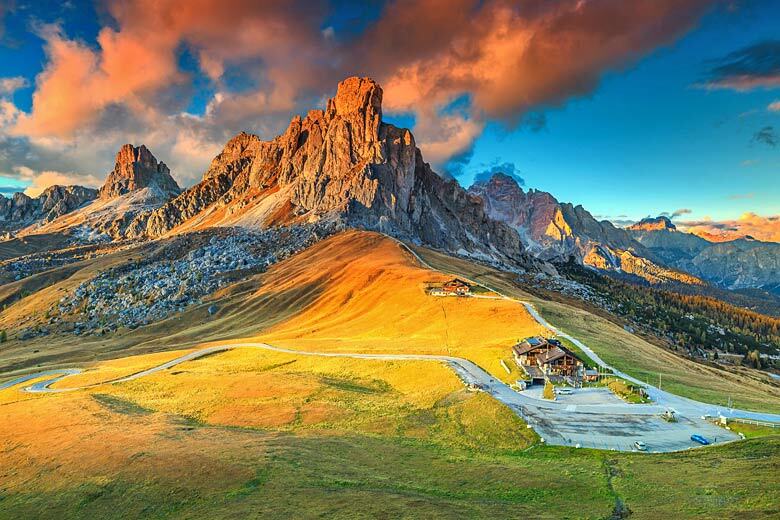 Even more spectacular, from mid-September to November, the larch tree leaves in the Val Gardena change to deep orange and the low evening rays transfer their vivid colour onto the pale stone masses, making them 'burn'. These 'Burning Dolomites' are dazzling. No one can resist singing the song Edelweiss in the Alps, celebrating the simple mountain flower in The Sound of Music. Written in 1959 by Rodgers and Hammerstein, it was composed for the character of Captain von Trapp. Edelweiss (Leontopodium alpinum) belongs to the daisy family and rather than 'small and white' the appearance is more a woolly silver, with dense short hair that helps it survive. Long used for its medicinal properties to cure stomach-ache, the bloom is also a symbol of purity. A gift of edelweiss to a beloved is a promise of devotion but it's a protected plant that needs to seed so shouldn't be plucked. South Tyrol has almost 20,000 kilometres of official hiking paths and the circular Zannes Nature Path is accessible for sturdy buggies and wheelchairs. Puez-Odle Nature Park, named after the Odle and Puez mountains, covers an area of 10,722 hectares (41 square miles) and its dramatic landscape is the home of eagles, chamois, deer, marmots and spotted Eurasian pygmy owls. You're also likely to pass contented horses munching the rich grass. 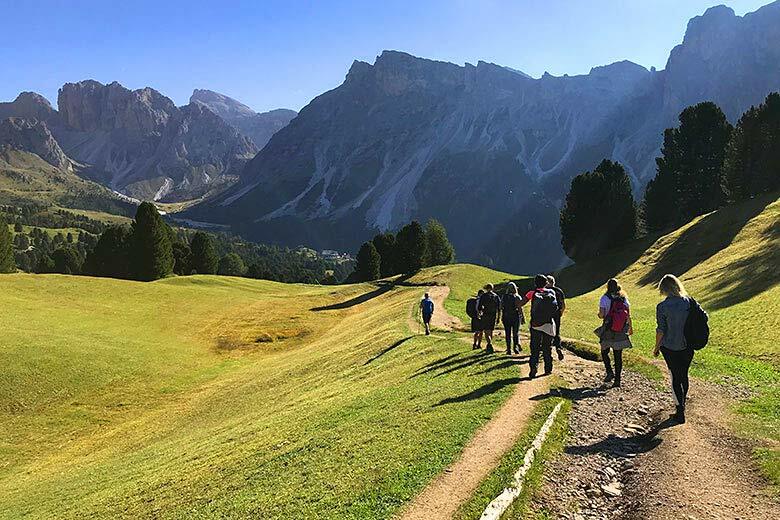 The Nature Park Information Centre in Santa Maddalena in the Val di Funes has details about guided hikes with park rangers. One popular route is taking the Col Raiser cable car to the pasture above, walking under the Odle Peaks and on to the foothills of Mount Seceda. A huge wooden crucifix is sited on the hillside with panoramic views. Val Gardena Active is a year-round programme with suggestions for all kinds of sporting activities. The Sella Ronda circuit of the Sella massif, a ski trail in winter, has a challenging guided e-bike tour in summer, only partly following the road. Kaiserschmarrn is the most delicious thing on earth for lunch when you've spent the morning heading up mountain trails, out of breath and shamefully overtaken by local five-year-olds in their tiny walking boots. The shredded pancake is named after Austrian emperor Franz Joseph I, who favoured this dessert, best served with fruit compote. A sweet batter is made using flour, sugar, salt, milk and eggs. The yolks are separated first in the recipe and the whites beaten stiff. Rum-soaked raisins are added and once the pancake is fried in butter, it's torn up with forks and sprinkled with icing sugar. 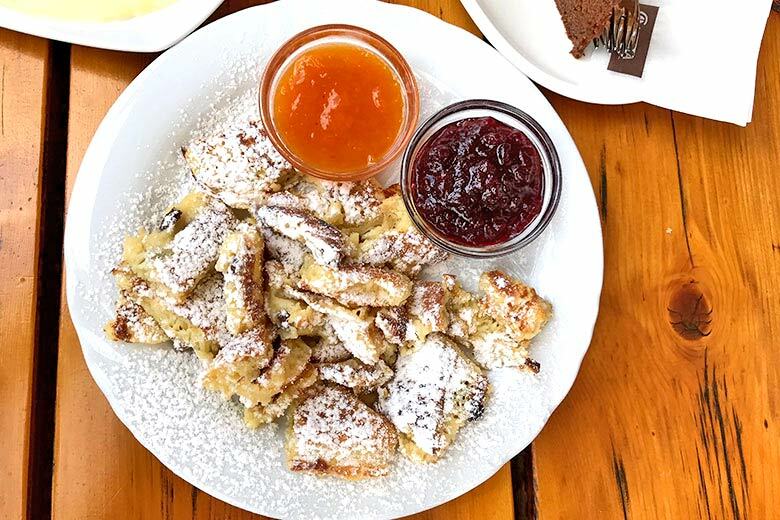 At the wooden chalet-style Baita Troier Hütte tavern at 2,250 m on the Seceda Mountain, bacon dumplings with goulash and a beer will also perk you up but leave room for the Kaiserschmarrn - also called Emperor's Mess - it's the food of gods. It's fun to try yodelling under the Odle (needle in Ladin) Peaks. With their eerie cliffs, the Odle Peaks were created from ancient fossil atolls in a tropical sea that formed when Europe and Africa were still one. Prehistoric fish and reptile skeletons have been discovered here along with dinosaur footprints and ammonites. The Dolomites are not a static geological zone, they're rising a few millimetres each year. The weird shapes of the terrain include towers, ridges and spurs, scree slopes and plateaus with lakes and deep gorges worn down by streams. The recent hot summers have thawed ancient permafrost and some rock fractures have changed the shape of several high peaks. Interested in finding out more about this region? Head to the Val Gardena website for the latest news, events, and travel tips. Held just once a year in mid-summer, the Dolomites Sky Dinner is a very special occasion. You can book a gourmet meal in an Alpe di Siusi Cable Car gondola, served by waitresses and sommeliers in traditional Val Gardena costumes. 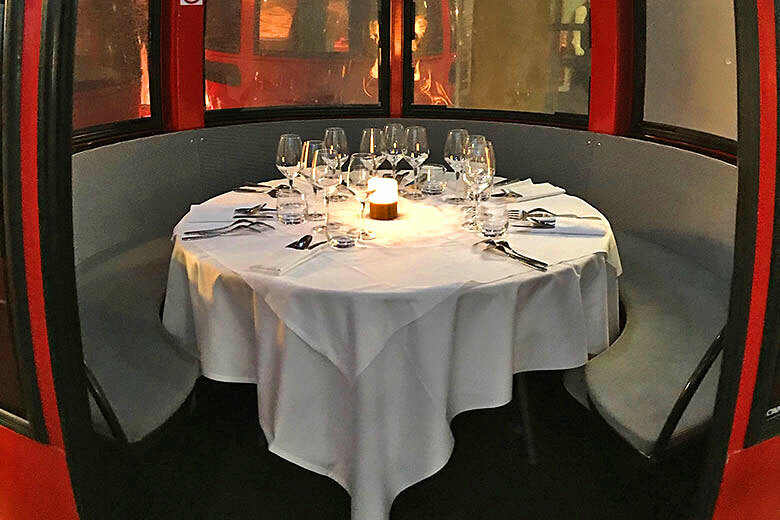 After an aperitivo, the gondolas, which sit six, travel up and down the mountain and four courses are swiftly served with accompanying Italian wine as the doors open and close and your journey continues. At the end of the evening, there's grappa and a bit of a party for all diners at the Mont Seuc restaurant at the summit with dessert, music and dancing, before the last cable car down at midnight. The next Dolomites Sky Dinner is on 10 July 2019. The centre of Ortisei is pedestrianised so shopping and stopping for a cappuccino is a relaxing treat. The choice of hiking boots and outdoor wear in this part of Italy is excellent, with gorgeous colours and attentive service. It's so charming it seems like a film set, especially when you see a group of friars in traditional brown habits going about their business in town. Do pop into the Val Gardena Heritage Museum, , which has displays of valuable fossils, stones and minerals as well as flora and fauna. St Jacob's Church is situated above Ortisei, on the ancient Troi Paian altitude trail that once linked this region to Venice. Believed by experts to have been founded in 1181, it's dedicated to the patron saint of pilgrims. If you're lucky enough to visit when a choir is practising outside, it's a mystic place. The church is tiled with larch wood blocks and what appears to be marble inside, is also painted wood. Burnt down twice, St Jacob's now has a Gothic and part Baroque appearance with late 15th-century frescoes on the walls. The city of Bolzano in South Tyrol is often considered to be a gateway to the Dolomites. It's around 37 km southwest of Ortisei in Val Gardena, which is why we have chosen it to best represent what the weather in the valleys of the Dolomites is like year-round. Tempted to explore the Dolomites this summer? Don't miss the latest deals from TUI on holidays to various destinations across this region of northern Italy.